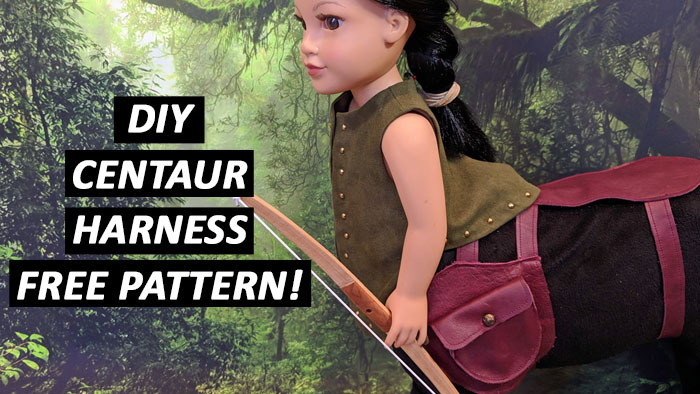 In my last video, I showed you how to make a centaur from an 18 inch doll and an 18 inch doll horse. Now your centaur needs some accessories. So let’s make a harness with a handy pocket and a place to hang a quiver. The pattern for this project is available FREE to all of my newsletter subscribers. If you are already a subscriber, you should have it in your inbox. If you’re not subscribed, you can sign up here. Once you’re registered, the pattern will be sent to you via email. Please note that this pattern is sized to fit My Life As horses and may need adjustment if your centaur is made with a different brand of horse. I just marvel at how your mind works. You are so creative. I would never even think of making a centaur much less the accessories. You are amazing. Thank you Mae Lynn. How my mind works is a mystery even to me 🙂 I’m really enjoying doing the videos because I have a lot of ideas that are not necessarily suited to typical PDF patterns. This way I get to dabble and share it with you guys.